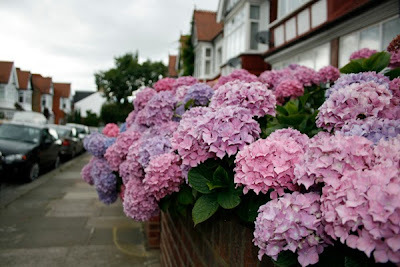 Mid-March, and time to prune the vast hydrangea at the front of my house. They are unfashionable these days, relics of the 1970s, but I love its huge, showy flower bosses, mine a lovely, unforced mixture of pink and violet. I leave the fading flowers on through winter, partly to protect the plant from frost and partly because they look lovely. But by March the new buds are bursting out all over and the bush becomes a strange mixture of nostalgia for a summer long gone, and impatient new growth. It is meditative work, the kind that allows one to daydream. First the flowerheads come off, now sere and brown, each stem snipped back to a pair of healthy buds. The structure is revealed, including those stems which promised much last year, but produced nothing: I take them out. Also those presumptious enough to grow across one another, or tangle. An outbreak of scale mites sends me scurrying anxiously to my RHS book: little to be done. They are only trying to get by, after all. As we all are. The dog sits on the front step, waiting for me to finish and sniffing the chilly March air. It rained this morning and the cut hydrangea stems are damp and pliable; I push them easily into a plastic sack. Sudden sun shafts down before a brief shower blows over. Woman pass with prams, the wheels a quiet rumble on the pavement. I find an empty wallet beneath the bush and leave it on the wall. Once the job is done the bush looks naked and undefended. Yet this is the sixth year I have done this and I know that within two weeks it will be bushy and green, and in June it will be glorious again.